Road Trail Run: Analysis of my Boston Marathon Shoe Options-Review New Balance 890 & Initial Impressions. 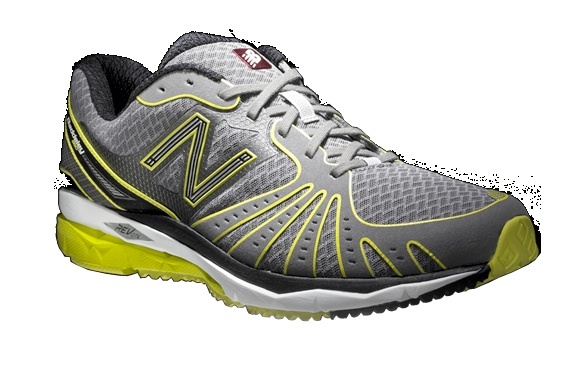 Analysis of my Boston Marathon Shoe Options-Review New Balance 890 & Initial Impressions. As the Boston Marathon approaches I have been mulling my shoe choices. I run in neutral shoes and have a short slide without much knee lift. My half marathon times at age 52-53 have been between 1;35 and 1:39. I qualified for Boston at the St. George Marathon with a 3:29 at the St. George Marathon in 2009. For the hills of Boston and a planned pace of 8:00-8:10 I need a responsive shoe with adequate heel cushioning. While I have been improving my mid foot stride I will not be able to hold form all the way to the end. I also want a light shoe, less than 10 oz. 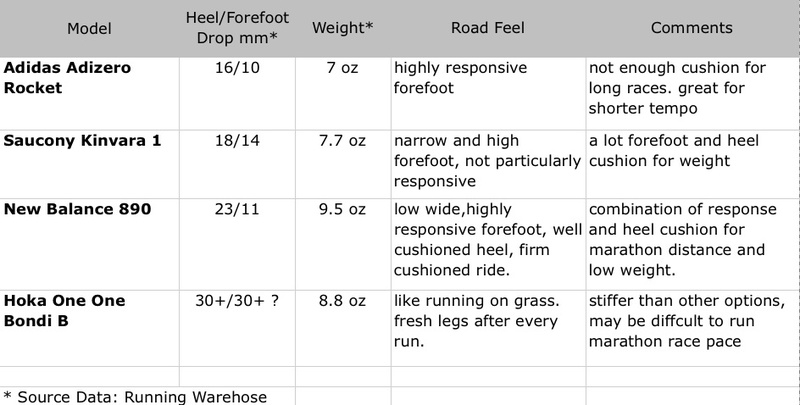 Below an analysis of my current shoe quiver. 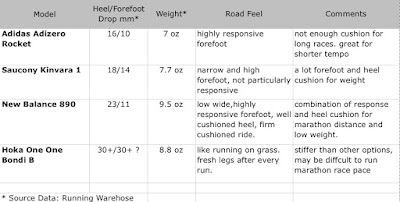 What I am finding is that a low forefoot height is key to a responsive feel but I also need good heel cushion for the later miles when form starts to fall apart. Both the adizero Rockets and my brand new New Balance 890 have about 10 mm of forefoot height. The Kinvaras at 14mm feel high are somewhat unstable, feel high, at speed. They also flex gradually ie not pronounced at the flex point in the forefoot and are somewhat stiff. The Hokas with a low heel to forefoot drop at 4mm with incredible cushion and light weight 8.8 oz are so far ( and they do require break in given the high stiff midsole) are somewhat harder to maintain paces below 8:30 per mile. The Kinvaras while adequately cushioned in forefoot and heel but are narrow in upper toe box and forefoot midsole strike platform. Yesterday at my local running store Runner's Alley in Portsmouth NH I tried a pair of the brand new New Balance 890. Very light at 9.5 oz the 890's feature REVlite midsole foam, the white foam in the picture below is 30% lighter than conventional midsole foams according to NB. The white REVLite extends to the front of the shoe all the way to the toe box with all REVLite on the inner part of the foot and partial REVLite on the outside of the foot. No motion control features on the inner side. 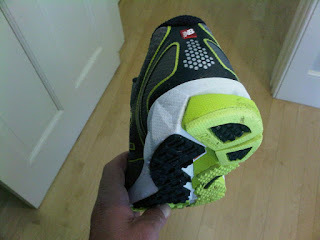 The yellow foam is firmer and extends on the outside of the foot up to just before the flex point in the forefoot. The softer REVLite forward across the whole shoe forward allows a good flex. The thin layer of yellow foam is the outer sole material up front. 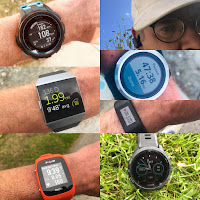 Likely REVLite is more or less the same material as the Kinvaras and Hokas but to me it felt more responsive on the run: firmer yet also cushioned. 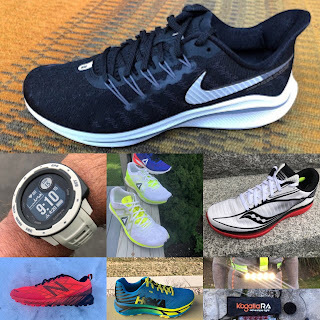 Part of the responsiveness is of course the low forefoot height and it seems a wide forefoot strike platform, and a well designed easy flex at the forefoot flex point. The upper is not over reinforced. The toe box is wide without excess material or stiff overlays. I sized up half a size to 9 for a little extra room as feet swell in the marathon. My first run in the 890's, a 6.39 mile jaunt around New Castle in blustery weather was excellent. 8:00 pace. I liked the 23mm of heel cushion on the rolling downhills. The forefoot is responsive and flexible. They climb well. My only concern so far is the greater than usual, for me, heel toe ramp of 12 mm. Most of my current shoes are 4-6mm and I do feel something today I have not felt in months, some calf tightness something I never feel in the Hokas. 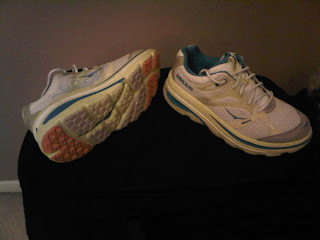 I will continue to focus on the 890's and Hoka One One Bondi B as potential Boston shoes in the coming weeks. I'd go with the Kinvara's based on your options. You are used to the smaller heel drop and you've used it before. I always say....stick with what works!!! I always try tons of shoes but stick with the usual in the end. I've used the kinvara for half's and last year at Chicago in the marathon.